Cycling is fun and perhaps the most beguiling way to effortlessly climb tough mountains. It’s the most sustainable, pocket-friendly, and fastest two-wheeled means of transport. Cycling gets your muscles and joints busy. It puts your body in the state of activeness hence triggering sweating and burning of calories and excess body fats. Electric bikes integrate efficiency, speed, and luxury to make cycling less wearisome and more fun. There are multiple e-bike types, styles, varieties, and designs. Getting one that is durable, high-quality, and has high-performance is harder than you think. The real trouble comes when you have to locate a good quality and high-performance bike that’s less than $1000. 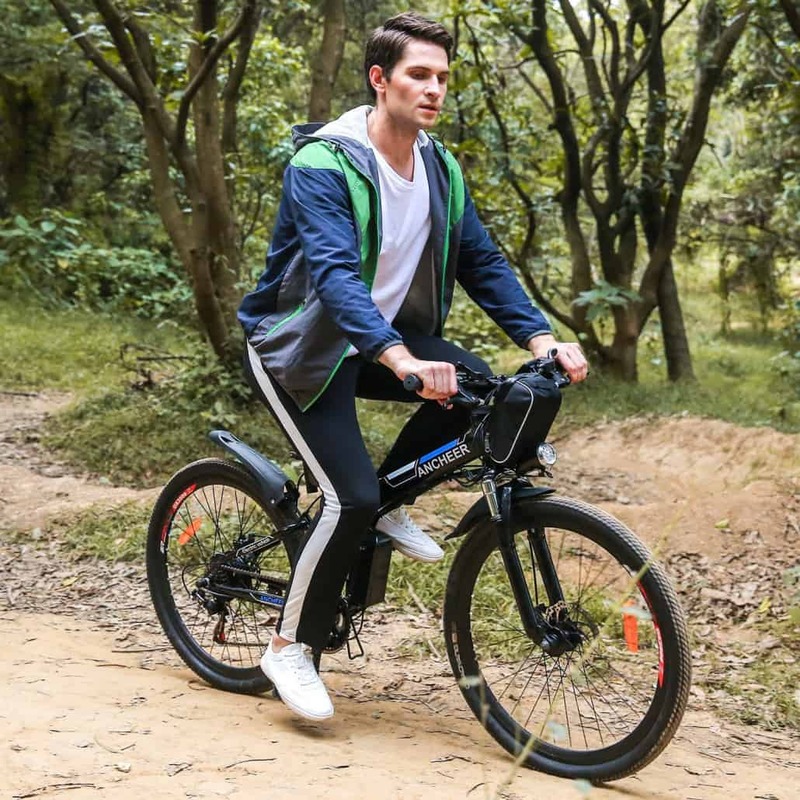 Regardless of your personal preferences and budget, you can still get a high-quality and durable electric bike without overspending. 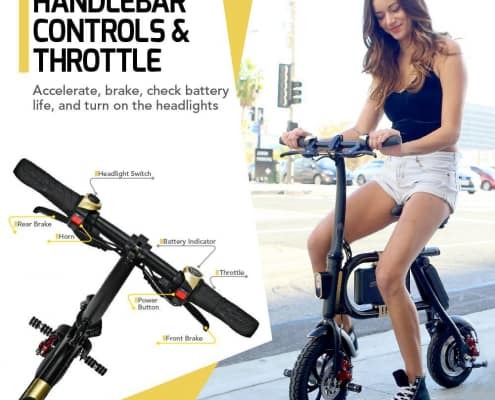 So what are the best Electric Bikes this 2019 you ask? 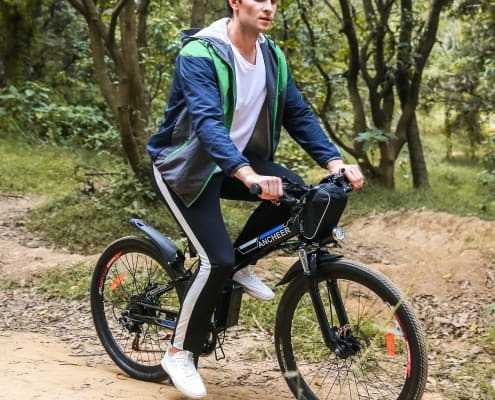 E-bikes are the most environmentally-friendly solutions for those looking to enjoy the fresh air outdoors without exposing the environment and humans at risk. They are the fastest, safest, fun, and the most reliable way for you to climb hilly and touch mountains. Thinking of investing in an electric bike, here are the top 5 bikes under $1000 to consider. Let’s be honest for once. There are some things which matter when buying electric bikes and others which don’t. The bikes exterior look matters and you shouldn’t compromise on it. If you aren’t pleased by the look of a certain bike, you will never feel at ease and comfortable cycling it around. The battery placement and frame style also matters. 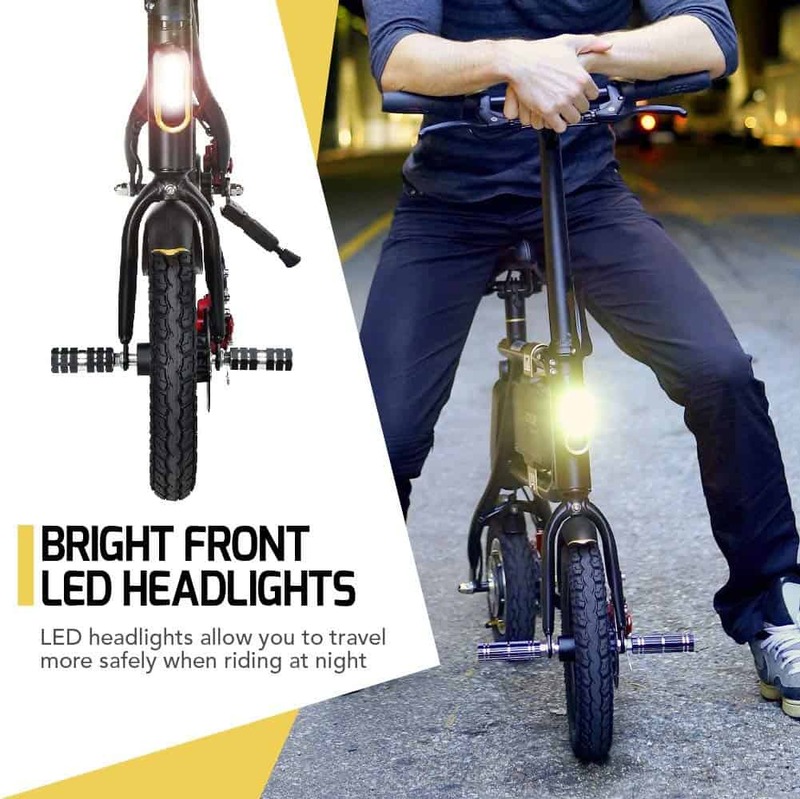 The bike frame styling and battery placement greatly affect the cycling comfort. 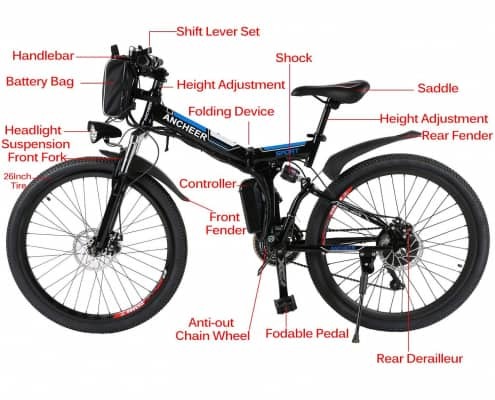 Let’s have a look at the key things to examine before you buy an e-bike below $1000. Check the battery strength and capabilities also. Electric bikes are strictly powered by batteries. Different batteries have different voltage limits. 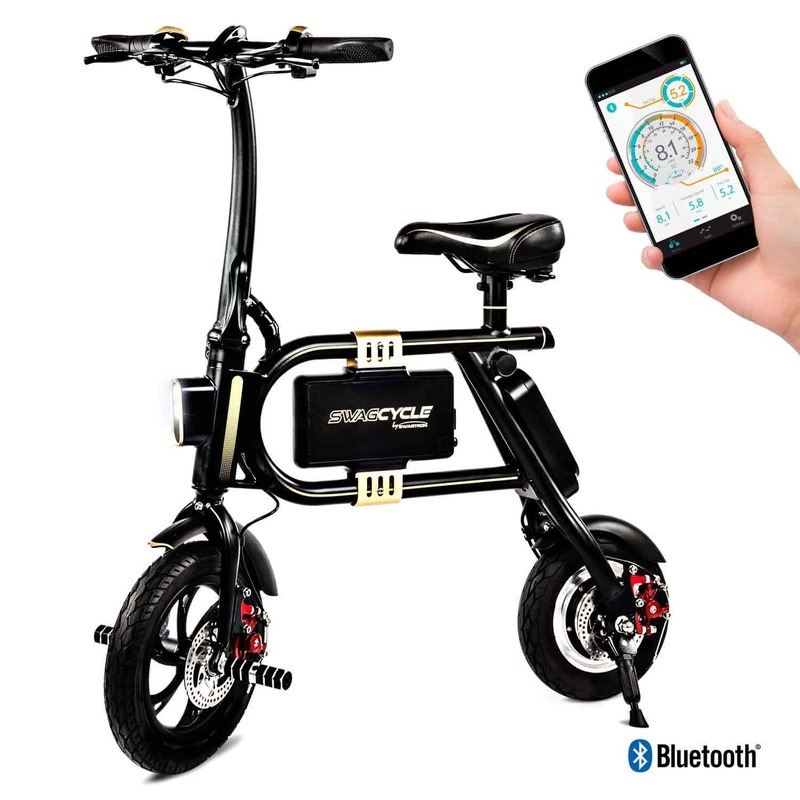 The maximum battery voltage rating determines how far you can cycle with a single charge. 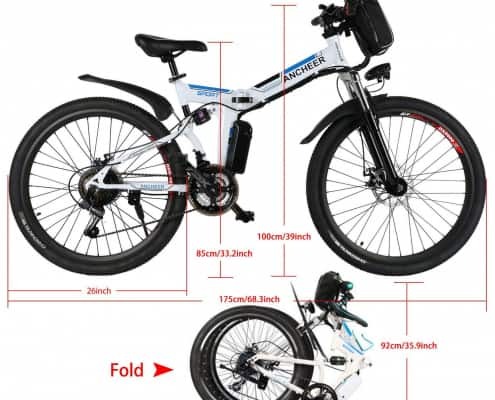 Based on how long you want to be cycling, you have to get a bike with a powerful battery. The most common types of batteries used on most bikes are nickel-cadmium, lithium, and lead-based batteries. Lead batteries are cheaper yet heavier and more susceptible to climatic changes. Lithium batteries perform better, are more powerful but are a bit more costly. As for nickel-cadmium batteries, they are lightweight but have memory issues which make them not very effective. Choose wisely and avoid yourself the stress and disappointments. Dig deeper to know what is hidden under that beautiful exterior. Check out the e-bike number labels to know the total amp-hour and volts. Don’t forget that the higher the voltage, the more power you will have, the smoother you can climb up big and tough mountains and the higher the speed you can attain. Therefore, you should pay keen attention to amp-hours and maximum volts. Electric bikes are powered differently. 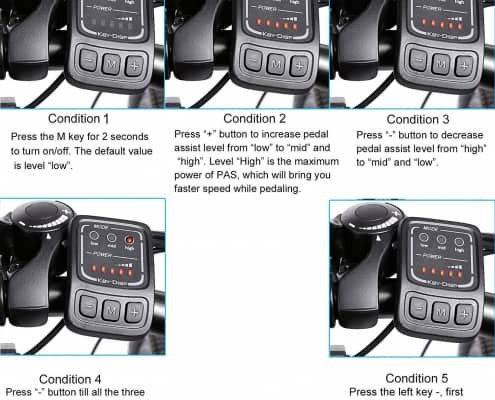 There are those powered manually by pedaling or pedal assists, and others powered electrically by throttle modes. You must make sure you get the right one. If you hate pedaling or have knee problems, you should consider getting an electric bike that is powered via the throttle modes. Quality is also one of the key aspects that matter. You should never settle for less. You need to get the perfect bike that is of high-quality. 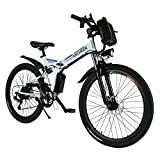 E-bikes are rated based on their performance and reliability. You can check out the bike’s ratings and reviews on different review sites to confirm if really it is of good quality. The maximum bike speed likewise matters. Electric bike speeds mostly depend on the performance range and battery wattage. The estimated power output also plays a crucial part in determining the maximum speed a bike can attain. Don’t forget to check your country laws regarding electric bike maximum speeds. You don’t have to find yourself on the wrong side of the law. So, it is best you inquire about the legal maximum e-bike speeds in your country. Electric bikes have limits when it comes to the total amount of weight they can support. While most batteries are able to support people weighing up to 300lbs, it’s totally wrong and against most manufacturers’ weight recommendations. Many bike manufacturers recommend that bikes should hold a maximum of 50lbs. In other words, many manufacturers recommend that bikes should hold people with weights lower than the actual bike weight in order to guarantee reliability. The heavier the rider, the quicker the bike will wear out and the higher the risk of the spokes and wheels getting damaged. 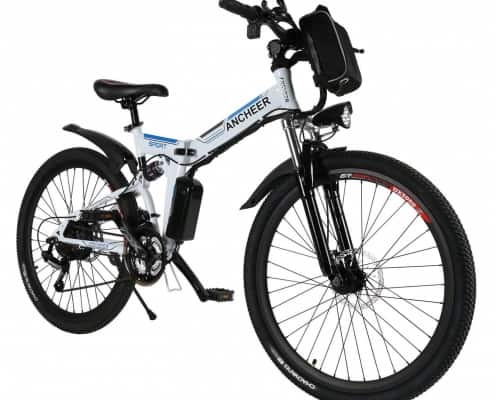 Ancheer electric bike has a high-performance design, complimentary large wheels, and a strikingly robust looking frame. Ancheer’s framing is totally made of aluminum allow something which makes it both strong and lightweight. To add to its strength and robustness, the framing is rugged with anti-exposure and anti-rust paint. The 26-inch magnesium allows bike’s wheels combined with the anti-slip resistance tires provide better grip to guarantee smooth and accident-free cycling even in rainy and snowy weathers. 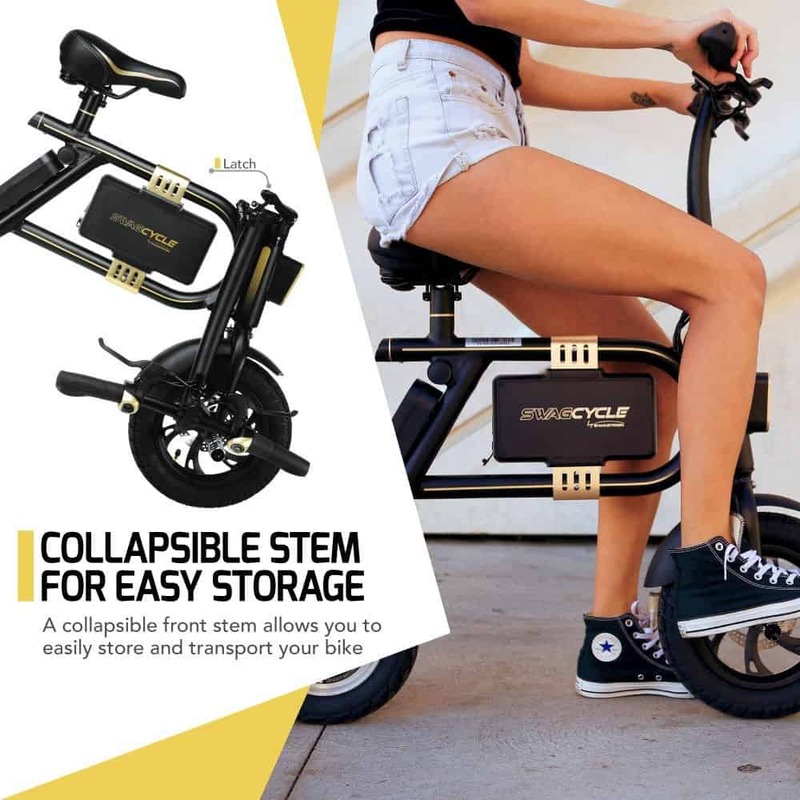 The bike’s folding mechanism is sturdy and feels quite robust even when extended a feature you can’t get with ordinary bikes. Due to its ability to fold down, it’s incredibly easy to store. Under the hood, Ancheer houses a 36V 8A battery system which powers a 250w brushless motor. 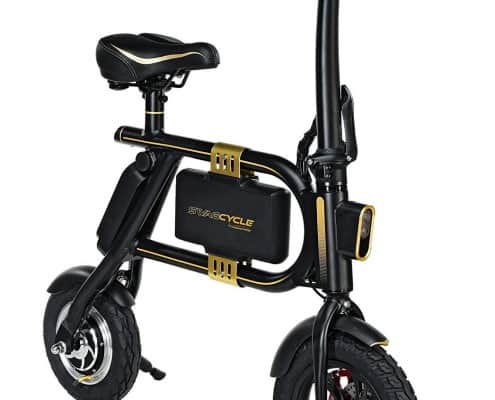 The battery system is conveniently and safely mounted just after the handlebars. It runs on two modes, the e-bike, and the assistive mode. While on the e-bike mode, the bike runs on its own and will give you not more than 20 miles of continuous ride. 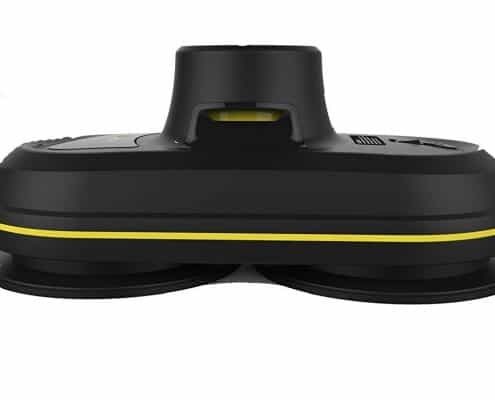 When on the assistive mode, it will give you enough power to ride for up to 30 miles continuously. Depending on the maximum output on the socket where you connect it, the battery will be full within 4 to 6 hours. 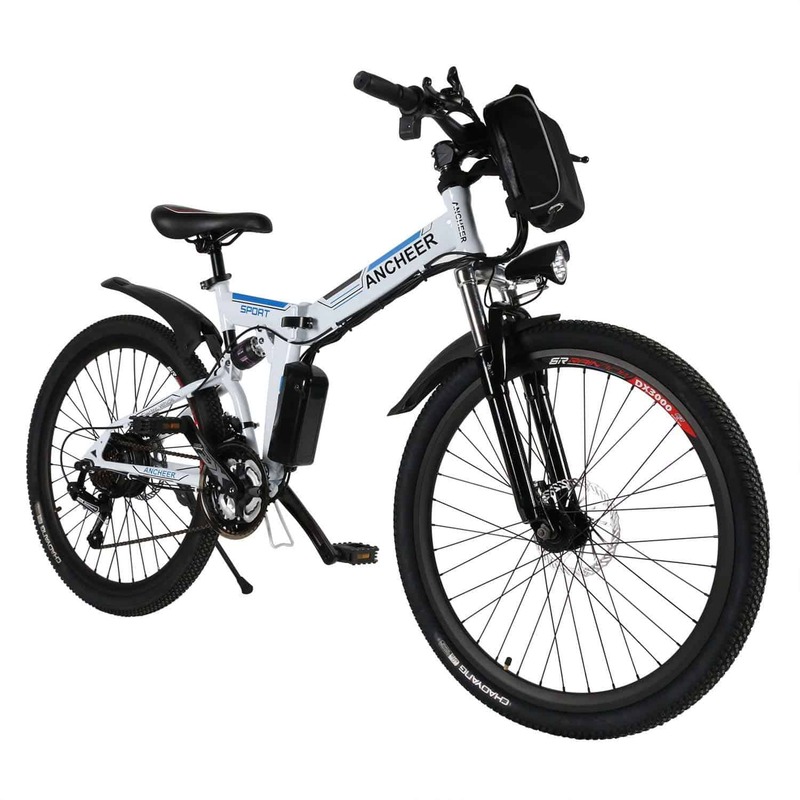 Ancheer e-bike features both a rear and front suspension. The front suspension is created from high-strength carbon steel shock absorbers while the back suspension is crafted from a single shock absorber which placed under the seat. Both suspensions work together to deliver a more comfortable and intriguing ride. Also, the bike has mechanical disk brake systems at the back and in the front parts. 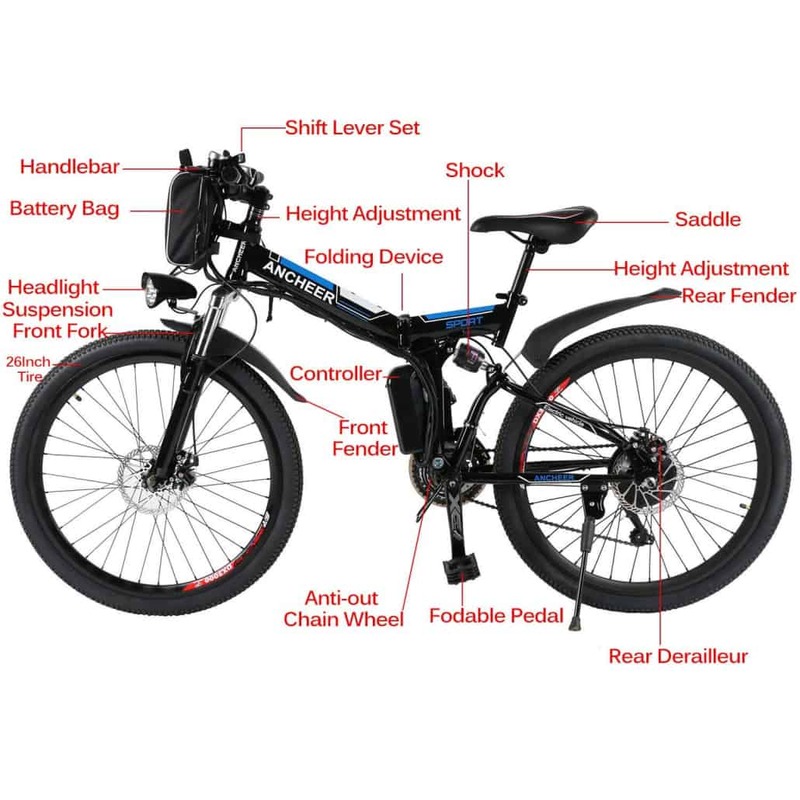 To add to its great features is the 21 speed Shimano gear transmission system that is customized to make your ride as smooth and comfortable as possible. 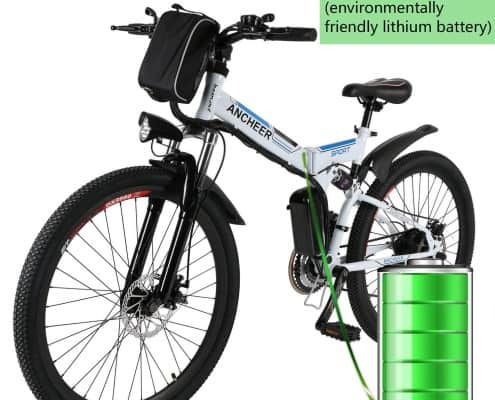 If you are searching for an affordable and powerful electric bike and you don’t want to break your bank, Ancheer e-bike is certainly the perfect choice. It delivers an incredibly high speed of 16mph which makes it one of the fastest bikes on the market. 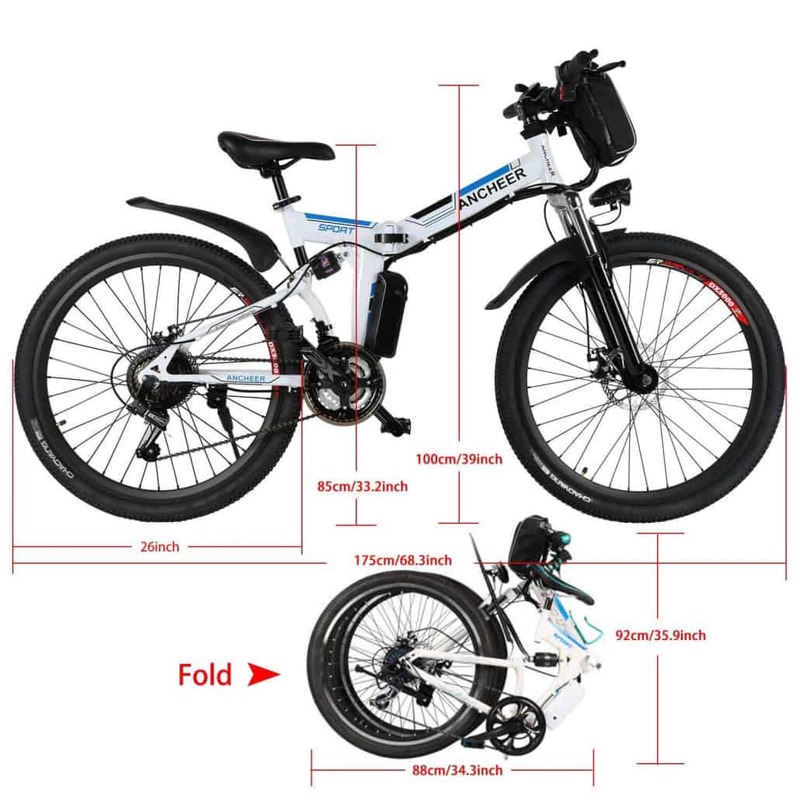 The high bike speed is triggered by the low bike weight and the powerful battery system. It performs quite well for a bike of its caliber. It offers great value for money. 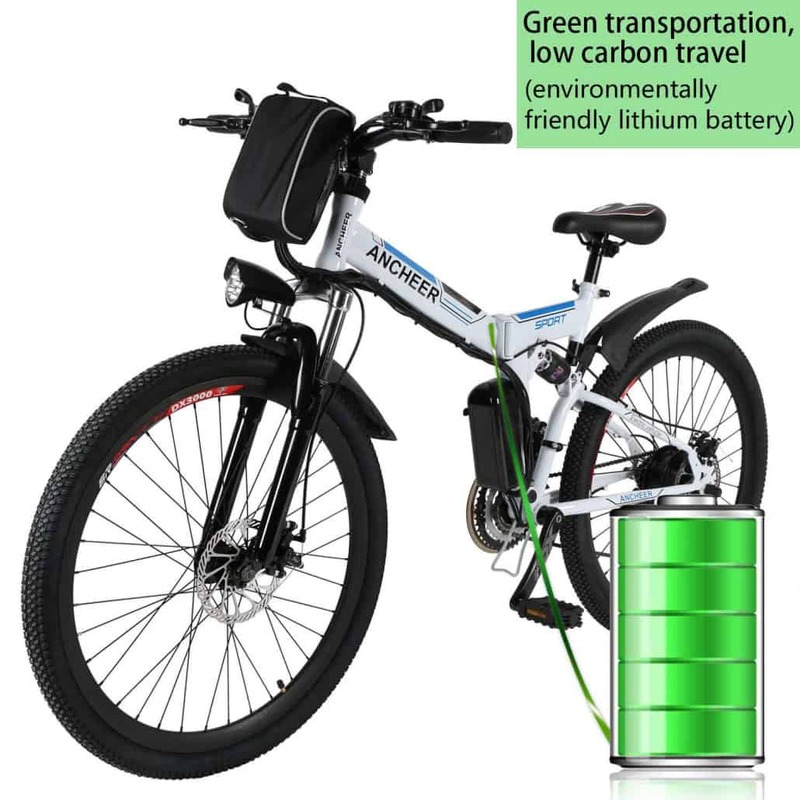 The astounding performance, great build quality, and low pricing make Ancheer the perfect e-bike below $1000 which promises to offer the best value for money. It is incredibly versatile. Ancheer works quite fine when on and off the road. And since it can be folded, it also means that you can use it as a commuting bike. It is ergonomically and smartly made. The bike is made of high-quality and durable materials something which guarantees long-lasting service. Have lots of great features. The robust and well-made front and rear disk brakes, 21-speed transmission and front and rear suspension make it one of the most feature-rich bikes available in the market today. Acceleration is not quite good. Considering the low weight and the powerful battery, the bikes maximum acceleration could be a bit higher. The battery pack is not quite good for a bike of its caliber. 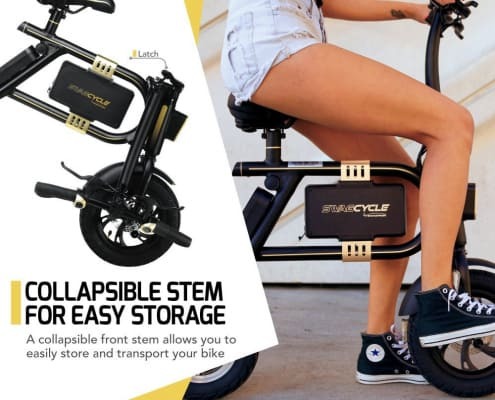 Swagtron Swagger is a swaggeristic modern-day bicycle that includes a collapsible frame and foldable design. It’s one of the cheapest bikes you can get under $1000. It runs on a powerful 36V battery which powers a 250w motor. Considering its foldable nature, the bike requires minimal storage spacing. It also takes the least time to charge since it will be fully charged within 2 and a half hours. 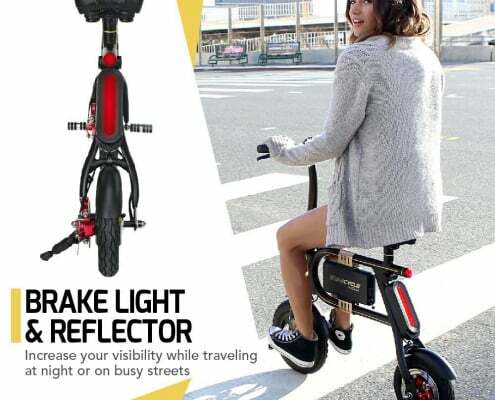 One of the noticeable features of this swaggeristic bike is the high-grade aluminum frame which can endure all environmental and weather threats. 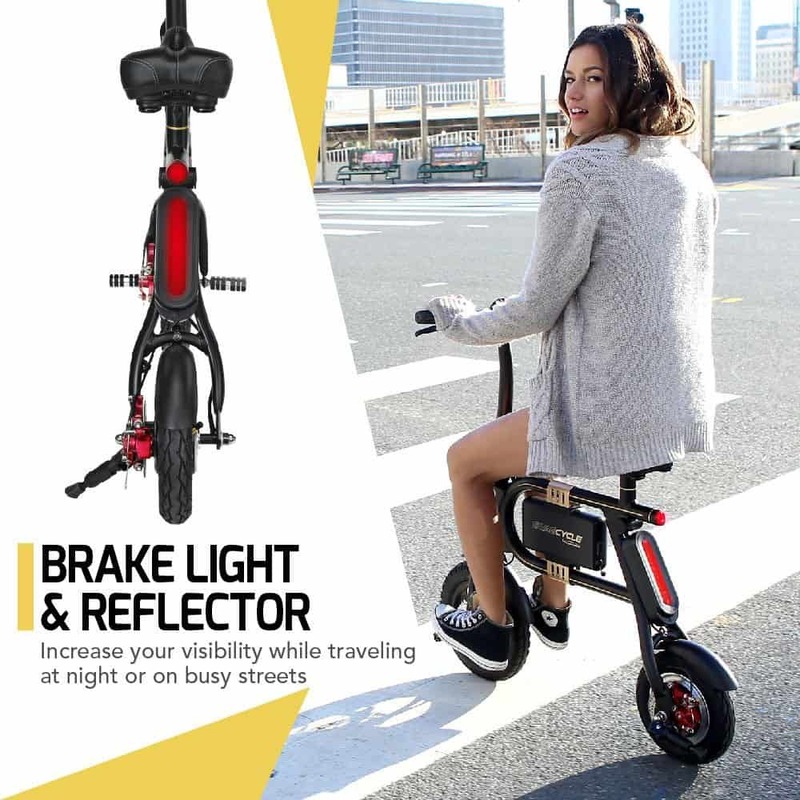 Swagtron Swagger is certainly the bike for you if you want a feature-rich and powerful electric bike that meets your swaggeristic lifestyle. 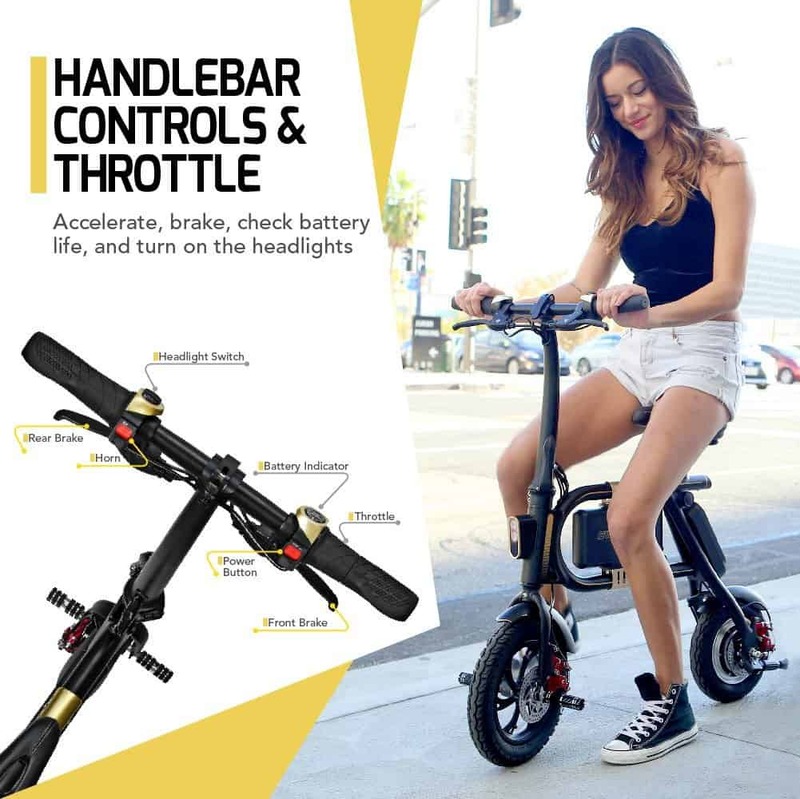 It features a horn, a very reliable braking system, well-designed handlebar display, bright headlights, long-lasting battery, and lots more. The fact that it runs on battery system means it does not generate toxic emissions and it’s definitely one of the most eco-friendly choices to consider. 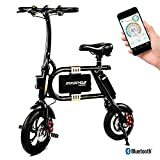 Riding the bike is simply effortless as you don’t require any special skills considering it’s easy to handle and has a powerful battery for facilitating its smooth operations. It is also the most convenient and easy-to-handle bike for facilitating smooth and fun commuting. Maintaining the bike also does not require any special skills. It’s smaller in size and a bit lightweight. 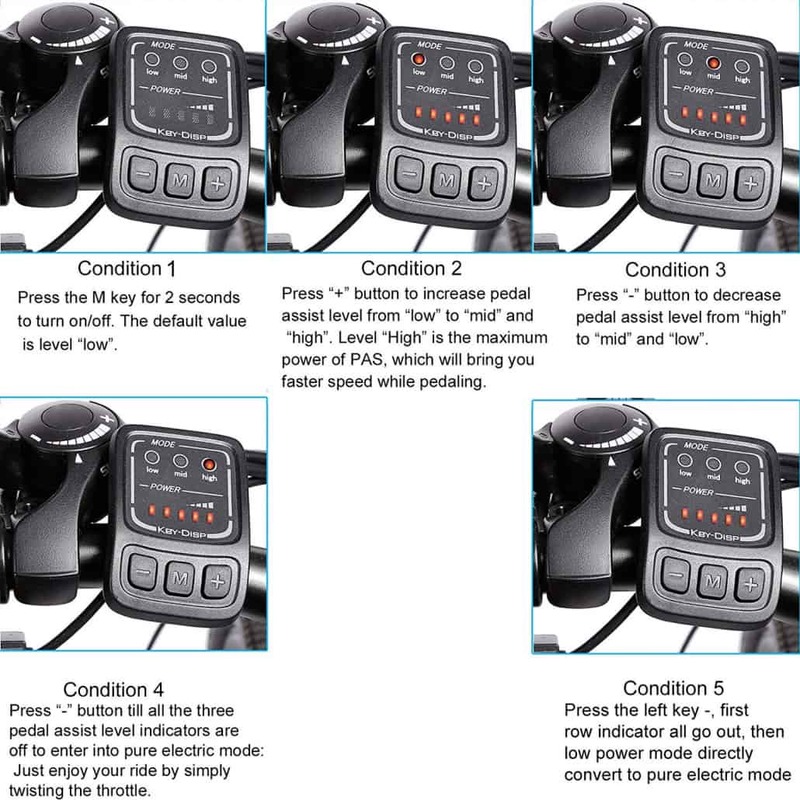 The bike also includes tons of extra features that aren’t common with similar bikes. 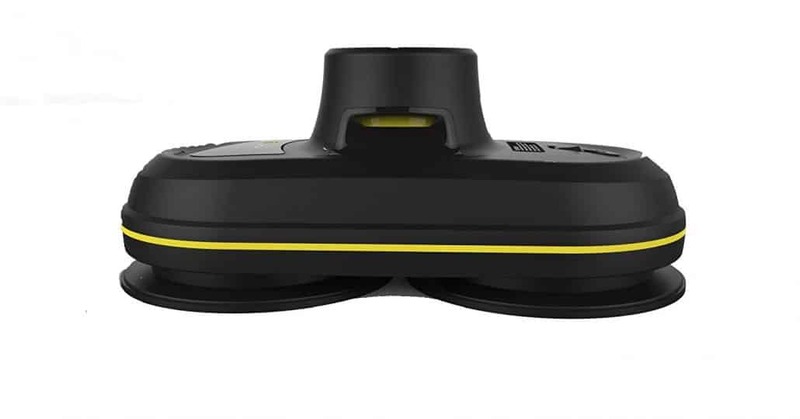 Among these features include a micro USB charging point that’s built into the battery system, a twist throttle, front headlight that facilitates comfortable night time riding, built-in horn, an accompanying mobile app, and kickstand. 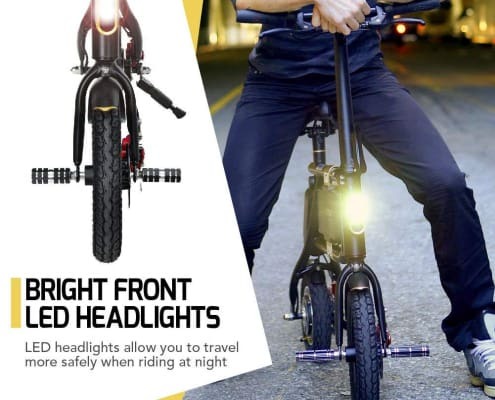 All this makes it one of the must-haves if you commute a lot and you always prefer riding. Unfortunately, the bike does not a suspension which makes it quite rough and not ideal for longer commutes. 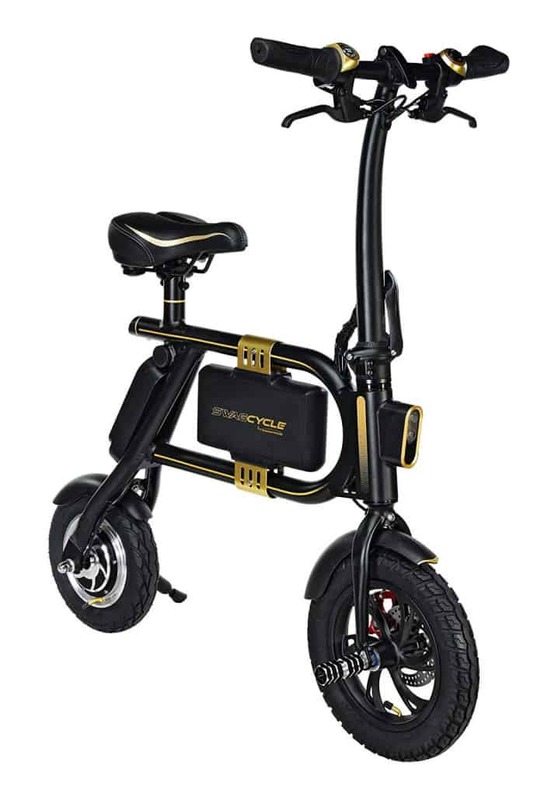 Swagtron Swagger has a swaggeristic design and appearance which makes it the perfect choice for city and busy streets commuting. It’s has a light weight of 24lbs. Due to its lightweight nature, it can hit extremely high speeds. Its simple construction allows for easy and smooth rides with minimal cycling skills. Includes great features such as battery charger status monitor and electronic horn. It’s quite affordable considering its many features and great design. It comes with a built-in USB port which allows for easy and fast phone charging. The pedals are mounted on the bike front something which makes them a bit hard to adjust. It’s extremely small so not ideal for people who would prefer a big better electric bike. 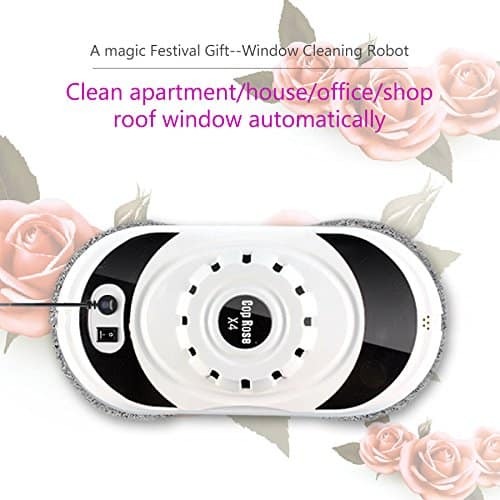 This window cleaning robot features a black and white design. You can easily power it on with a start button located on its front part. It features a unique Smart Move Navigation technology that enables it better clean your windows. With this feature, this window cleaning robot can spray, power itself on, and start cleaning on its own. It takes around three minutes for this window robot cleaner to clean one square meter. 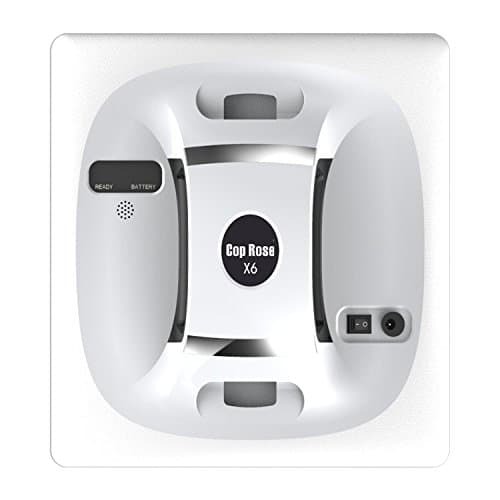 At the core of Cop, Rose X4 Robot Window Cleaner is a vacuum motor meant for creating a vacuum through two ports under its two microfiber pads. The microfiber pads then rotate slowly as the robot cleans the windows. Beneath the two microfiber pads attached to this window cleaning robot are a couple of motors that make the pads move and rotate. 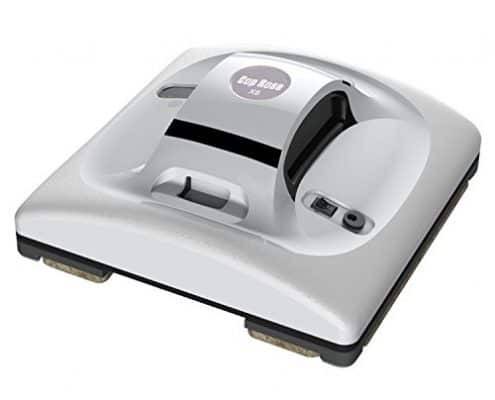 The pads rotate slowly meaning that this gadget will not only clean fresh stains but also caked on stains. 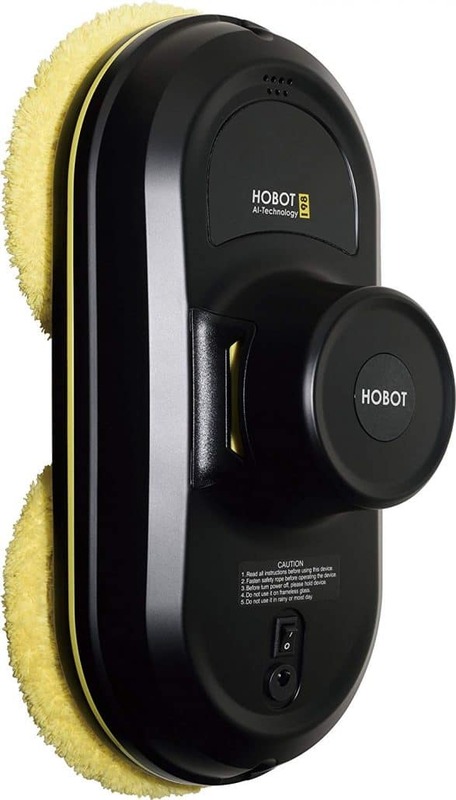 When using this robot cleaner, ensure that you avoid high humidity areas such as steam-filled bathroom windows as it will affect the way this robot sticks on vertical planes. Its microfiber pads are not fluffy enough so they cannot clean a large area. However, they will do a great job when it comes to cleaning the small areas they are set to clean. For better results, use this machine as a maintenance cleaner rather than the main cleaner; it will keep your windows sparkling clean. Its manufacturer comes with twelve extra pads, all of which are washable, and so you can have a fresh set while waiting for the others to dry. To protect Cop Rose X4 robot from falling off while working on a vertical plane, manufacturers offer a bungee cord that you tie on this robot and clip it on a solid object. The bungee cord is approximate 14.7 ft. or 176 inches long. It is important to tie this cord on the robot to protect this machine from crashing on the floor in case it accidentally falls off. 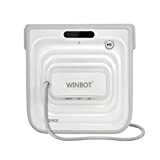 The Winbot 730 is a window cleaning robot that has a two-step cleaning process and does a great job of making your windows sparkle. 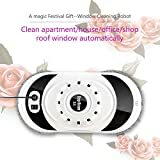 It has a motor-powered suction system that allows this window washing robot to stick to any glass surface including mirrors, glass doors, and tall multi-story windows. However, this suction system also ensures that this robot does not work on concave windows because it cannot create a good seal. 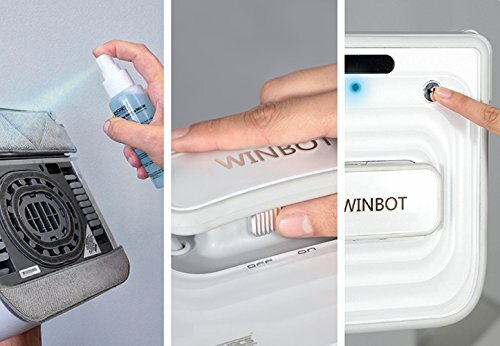 While it does not run on batteries, this robot cleaner comes with extension cords of varying lengths allowing you to clean windows in different heights. It comes with a squeegee for drying windows and two cleaning pads. While its motor-induced suction may fail at one point, you are given a safety line to prevent it from crashing on the floor. This robotic window cleaner immediately sticks to the window surface you place it on and then starts cleaning after you power it on. 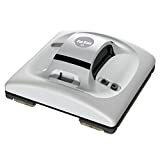 It uses a three-stage cleaning process with cleaning fluid and cleaning pads to wipe off dirt and stains and a squeegee to dry the surface to eliminate streaks. It then wipes the surface with a clean pad leaving your windows sparkling clean. The three-phase cleaning process mimics the usual cleaning process that human cleaners use. However, ensure that the cleaning pads are clean to avoid leaving streaks. This robot window cleaner is ideal to use with frameless and tall windows. It has a square shape and comes with a black and white design. Its power button is located on the front where also the Battery and Ready light indicators are situated to help you know the current status of this gadget. This model can clean in a linear pattern and takes around 2.4 minutes to clean one-square-meter. This robot window cleaner is most suited for cleaning windows in tall buildings. This unit has two cleaning modes both of which are highly efficient. 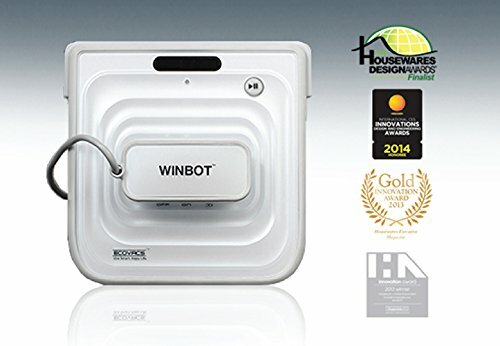 What makes it unique and different from other window cleaning robot is its anti-drop design. This device is easy to carry thanks to its small design. 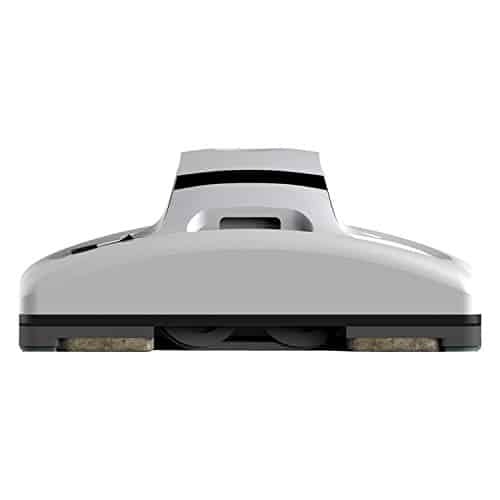 It is equipped with laser sensors to help it map an area before cleaning and intelligent sensors to help clean an area by itself. This unit features intelligent pressure sensors that can monitor the pressure condition of the area it’s cleaning. Besides, this unit can be operated using a remote control meaning you can easily guide it to clean specific areas. 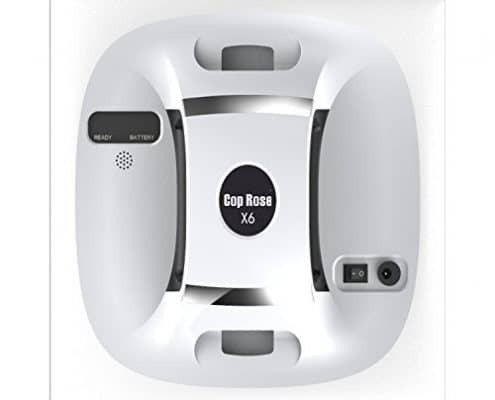 Cop Rose x6 robot window cleaner helps you clean your windows and other glass surfaces without any risk. 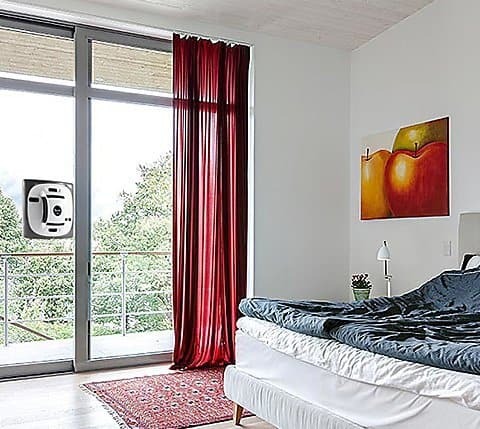 Previously, such products used to attach to window surfaces with magnets, but x6 smart robot window cleaner fixes itself to the surface using a vacuum pump. 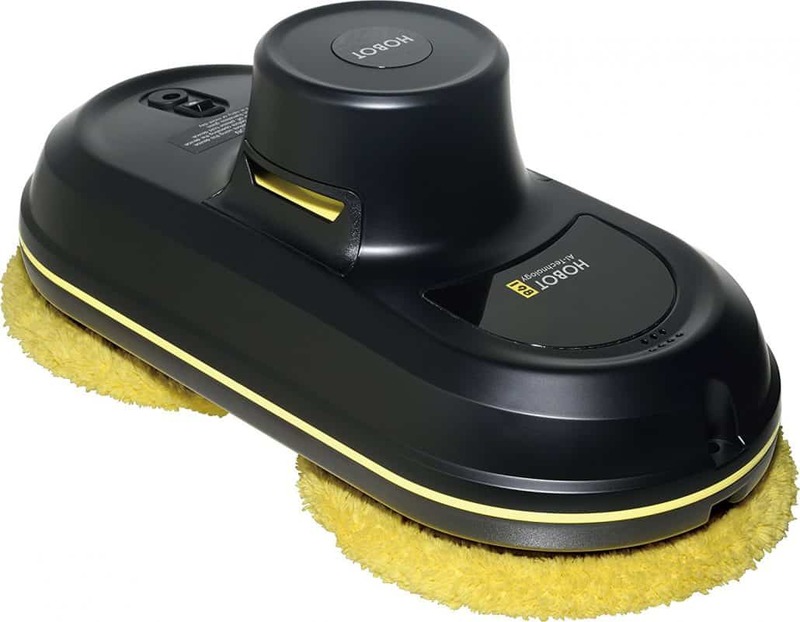 This device is also battery and power operating giving you a continuous cleaning experience. 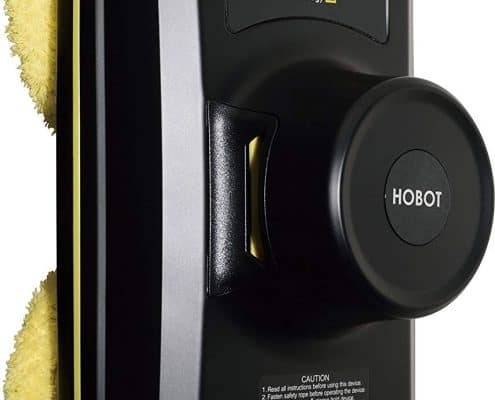 The Hobot 198 is an environmentally-friendly robot window cleaner that can also be used to clean flat glass surfaces. It uses motor-powered suction that makes it attach to the glass surface it’s cleaning. With an anti-dropping technology, this unit cannot fall in the event of power outage. 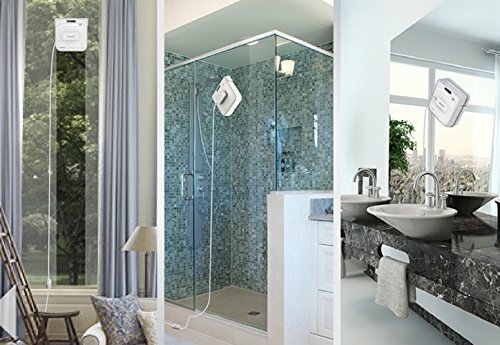 This smart unit offers multiple cleaning modes for enhanced user control. It has no maximum thickness restriction as it is single-sided, and so you can clean any window surface with more than 3mm thickness. It features an internal battery pack that you can charge using the included cable. You can also plug it into an outlet using the provided power cord and clean your surface while it charges. An LED orange indicator notifies you that it’s connected to power while green indicator shows you the battery is full. 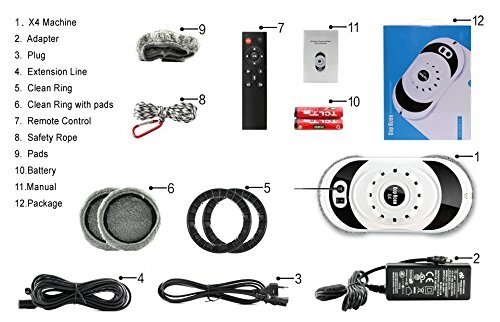 For increased versatility, this device has multiple automatic modes that you can adjust or program using the included remote control and manual option. 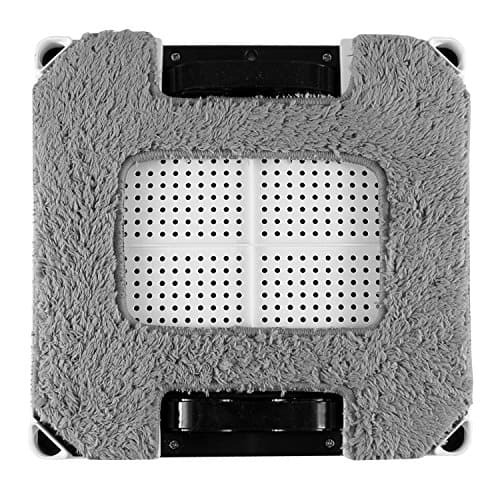 It uses microfiber cleaning pads included are machine washable, negating the need to buy new pads on a regular basis. If cleaning your office or home windows puts you at risk, it is advisable to consider a window cleaning robot. With a safety harness and extension cords, you will be able to enjoy streak free windows with your safety still intact. All the above six window cleaning robots have been tested and proven to be effective. We hope that our review has helped you identify the best window cleaning robot for your cleaning needs.